AViiQ thin series iPhone 5 cases? Discussion in 'iPhone Accessories' started by aimee.elizabeth, Oct 4, 2012. I've been looking for slim iPhone cases and have seen some other people trying to do the same, and I'm surprised to have not seen anyone mention the AViiQ cases. They're supposed to have a really slim fit, the material seems like it has a solid color matte finish, which imo looks really nice. And this is a video showing how the case fits on the phone and how it looks etc. If anyone has ordered this already, please let me know how you like it and all the pros/cons! I want this case but am skeptical because I haven't heard anyone else wanting to buy it or have it. It can't be that obscure, right? Thinking about ordering one too! Just looking to see if anyone else has any experience with it, and if it's worth the $20... from the pictures it sure looks like it is! Does this case have a lip of some sort for the front screen or is it flush with the front screen? Yeah it really does! I especially like the frosted one. I've been looking for slightly frosted cases because I really like the natural iPhone 5 back. And since Desmay Slight 5 proved itself to be somewhat of a failure, I might go for this one. The Desmay is 0.3mm and this is 0.7mm, even though it's more than twice the thickness, but how thick can 0.7mm be! So I'm willing to sacrifice a little of the thinness for a bit more protection and quality. I don't think that it has a lip from the video/pics that I've seen. So I'm not expecting any. Although with other slim cases there were some that had a tiny tiny bit of lip but I doubt it'd make that much of a difference anyways even if it does. I purchased the case. Should arrive in a week or so. I ordered it as well! It'd be great if you could post pics and let me know how you like it as soon as you get it! I really don't think it will be that bad because it's not completely clear and the case has a reasonable thickness - not paper thin like the Desmay, but it's still very very thin compared to other cases. How come all these super thin cases don't cover the top and bottom?? That would be nice! My guess is that the bridge of plastic would be too fragile over the top, and especially the bottom, with all the ports they need to keep the mic, speaker, and port open. Hey that's your opinion So if you don't like it, don't comment on this thread because it doesn't contribute anything to the conversation. But I personally think the frost looks really nice on the white iPhone, which you can see in the vid towards the end. It doesn't look as well on those pics on the black iPhone and for some reason the logo doesn't show through as clearly. Not sure if it's the lighting on the picture or what because in the vid it shows quite nicely. Nice looking case. I am clumsy. I need a heavy duty otterbox case. Just got the black case for the black phone. Perfect color match. Light and thin. Easy to put on and remove. Can't even tell it's on the phone. Not a fingerprint magnet either. I got the frost on the white and it looks amazing. Can barely tell you have a case. I really like the texture too. Not what you want if looking for a rubbery feel though. After owning the black case for a few days, and as much as I like the case, I must say it will not hold up well. The black matte case scratches extremely easy. Just sliding in and out of pocket will add scratches. After a month I think it will look like crap. The frosted case will probably hold up better. Well a week after ordering (not thru Aviiq) I finally got my frosted case. I honestly think it looks pretty good, very thin too. We'll see how it holds up over time, but this is exactly what I was looking for. No problem with third-party expensive headphones either. The frosted case looks really good on your white iPhone! What?! I utterly disagree with you, it looks really nice and I don't think that it makes the iPhone look ugly whatsoever. But that's your opinion and there's nothing wrong with that. I still haven't bought a case for my iPhone 5 and I think I'll be getting this one. I was thinking of getting a Desmay case but their Slight 5 in clear transparent is sold out. That looks horrendous on black. 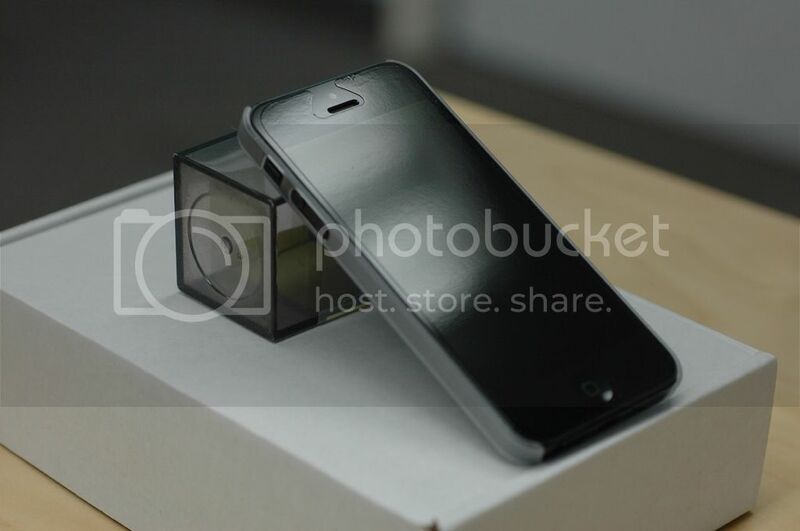 You can barely even tell it's a black iPhone. And what's with the screen protector on the front that leaves humongous gaps? Awful.